The Kayak & Paddle Board Club is an informal, participatory, seasonal gathering of interested paddlers, kayakers, canoeists and paddleboarders alike. 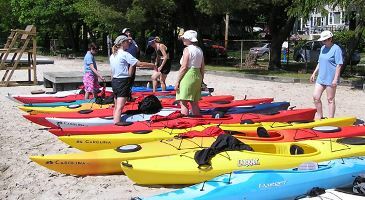 The Kayak Club plans several events throughout the summer including Open House Tours, a late evening paddle for the Summer Solstice, cleanup of the shoreline, an offsite trip and the Poker Run. The club also has four sit-on-top kayaks for club members to use on the lake, after a safety class has been completed. If you have any ideas for Kayak Club events, let us know. If you have any equipment to donate to the Kayak Club, let us know. We are always looking for life jackets, paddles, seats and of course kayaks. Please bring your PFD for all events and your LPPOA badge for all Lake Parsippany events.